When buying technical items with certain requirements – such as reliability requirements / SIL requirements – obtaining documentation showing that the requirements are all met can be a headache. Especially for SIL projects this can be the case, in particular if a particular vendor is not used to providing the correct documentation. When this is the case – what can be done to make sure we do not get delays and problems with non-conformity? The answer is as logical and straight-forward to state, as it is diffcult to implement. Experience has shown that some practices may make obtaining compliance documentation easier – and it is all about communication. FIrst of all – vendors must be made aware of the requirements at the time they are bidding for the sale – and not only a reference to a standard, but an actual explanation of what it means and what is exepcted. The party selling something should really try to understand this by asking the right questions…. but they don’t always do that.. So, communicating with the vendor from early on is important. This can be done by including requirements in the purchase order or contract. This is, of course, not enough. So, vendor follow-up should be part of the planning of the engineering activities – just like you would plan to spend resources on requirement setting or participating in FAT’s! When this has been planned – it is time to step up and help the vendor. Provide a guideline with what they need to deliver of documentation. Provide training to make them understand what is being asked of them – if they do not have the sufficient level of understanding. Make sure the responsible engineer for following up the delivery is also in the know about these requirements. Then the two contacts can speak the same language. The vendor needs to know what the actual requirements are. It is therefore good practice to develop and supply the safety requirement specification as early as possible. Of course – that may lead to later changes as more information becomes available, but as long as everyone is on board with that and changes are properly managed, including across interfaces, this is a much better situation than requirements coming to vendors too late. 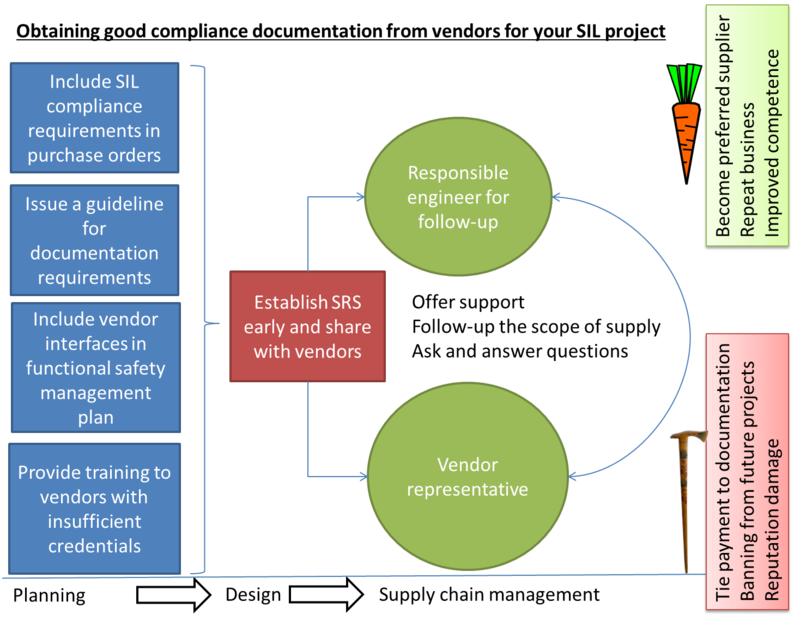 When the vendor has access to the SRS, the follow-up process should be intensified. Ask regular questions about progress – this may be done in an informal manner if the business climate is right. Open up for questions and be a support to the vendor in this process. Keep the conversation going. And make sure you get the progress you need. Tools for “expediting” progress should first and foremost be on the carrot side – let the vendor see real business benefit and value from providing good documentation and fulfilling expectations. Carrots can be things such as better chance of repeat business, improved vendor competence and standing in the market and possibly the option to become a shortlisted or preferred supplier? In addition to a bag of carrots, it may be necessary to carry a stick when soft talking no longer works. Metaphorical sticks may be things like payments tied to documentation deliverables, banning of supplier from future projects and general reputation damage. Hopefully you can keep the sticks hidden in the golf bag. This provides no guearantee – but thinking about this stuff is infintiely better than not doing anything. My experience is that a little help brings a lot of progress. To package these thoughts into a more condensed form you may refer to the following infographic – which sums up what to focus on during planning, design and follow-up. Infographic showing how to follow up with vendors to obtain the necessary documentation on SIL compliance.